Boyds, Md. (December 1, 2018) –Washington Spirit forward Francisca Ordega helped lead the Nigeria National Team qualify for the 2019 FIFA Women’s World Cup during their title run at the Total Women’s Africa Cup of Nations. After losing their first match of the tournament 1-0 against South Africa, Ordega and the Super Falcons went on a four-game winning streak to capture the African championship and secure a spot in World Cup. The streak culminated with a hard-fought victory in penalty kicks in the title match as they avenged their previous group stage loss to South Africa. Saturday’s final saw 120 minutes of scoreless soccer before the match headed to PKs, where Nigeria won 4-3. Nigeria reached the title match by earning a pair of dominant victories to finish group play, storming past Zambia 4-0 and routing Equatorial Guinea 6-0. In the semifinals, Nigeria edged Cameroon in penalty kicks after a defensive battle which also saw 120 minutes of scoreless action before the Super Falcons came out on top 4-2 in PKs. 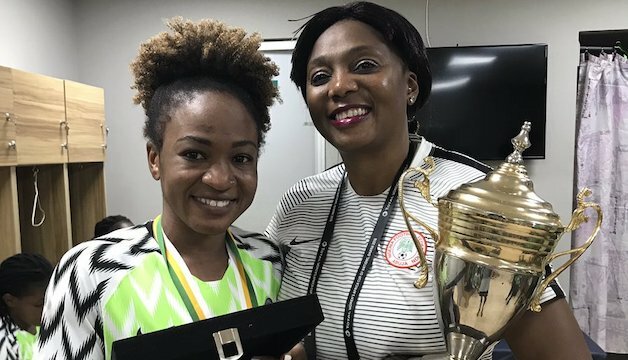 Ordega earned Woman of the Match honors twice during Nigeria’s title run, starting with her 1-goal, 1-assist performance against Zambia. She followed that performance by scoring the opening goal in Nigeria’s group stage finale against Equatorial Guinea. After helping Nigeria’s defensive and possession efforts in the semifinals, Ordega garnered her second Woman of the Match honor in the final against South Africa, as Nigeria controlled 52% of possession and racked up 18 shots. The African championship is Nigeria’s ninth title since 1998.